I'm Here. I'm Queer. What the Hell do I read? 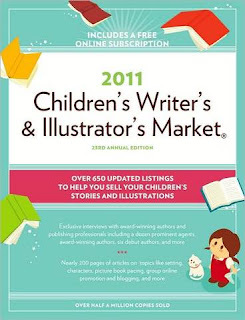 : My Interviews Are Published in the 2011 Children's Writer's & Illustrator's Market!!! My Interviews Are Published in the 2011 Children's Writer's & Illustrator's Market!!! And thanks to the amazing editor Alice Pope, I was given the opportunity to contribute three interviews to the 2011 Edition of the Children's Writer's & Illustrator's Market - a reference and inspiration 'bible" for the world of kid and teen lit that's sold over 500,000 copies in its 23 editions! 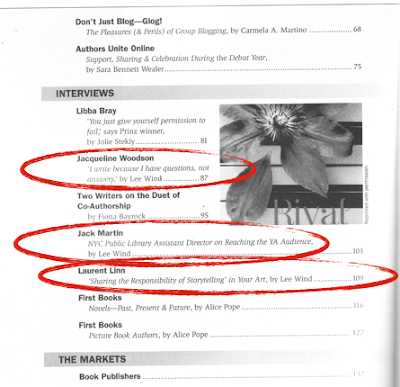 Here's the table of contents, with "by Lee Wind" listed three times!!! I'm really excited - Jacqueline Woodson, H. Jack Martin, and Laurent Linn all shared so openly and with such insight! "I write because I have questions, not answers." I feel so fortunate to have been able to have these deep and substantive discussions with Jacqueline, Jack and Laurent. To have the insight and knowledge of an incredible award-winning author: Jacqueline writes (and wins awards!) across genres, and had one of the best answers ever for how to tackle big topics (like racism, and homophobia) in our writing without it getting 'preachy.' To learn from an innovative librarian who knows teens: Jack is the quintessential out-of-the-box thinker, who brought video game competitions and alternative proms into the New York City Public Library, and through his innovation, connected to a whole new generation of kids. And to get the real scoop from a successful art director and artist: Laurent shared so much about what an illustrator's portfolio should include, and what the art should do! To have these three At-The-Top-Of-Their-Game experts answer MY questions was a heady experience. And hopefully, for those who read the interviews, it will be a conversation that will engage, enlighten, and inspire! I loved doing these interviews, and I'm so excited that now they're out there for the world to read! For you to read. Thank you Alice. And thank you Jacqueline, Jack, and Laurent. You made me look good! Congrats! I like your blog! I check it once in a while and always find interesting reading. That is really awesome! It must have been great to interview Jacqueline Woodson, I really admire her. And those Writers Market books are the very first books that a lot of aspiring writers read on the topic and make a big impact. So just think, your interviews will be seared into new writers' brains forever! Thanks Angie, AnaVar and ivanova - it IS awesome! I'm so delighted, and I really appreciate your kind words. Sweet! Good job, yeah? :D Hope to see your novel published next! Congrats, Lee! And I'm looking forward to (and confident I'll be able to) celebrating further publications of yours in the years ahead. That's awesome, Lee! Congratulations. You deserve the recognition. Just read a great chapter in Malcolm Gladwell's 'What the dog saw' about Young Geniuses vs. Old Masters and the space in between. Everyone's journey unfolds at it's own pace and for very interesting reasons. I thought of you. This is terrific and but one milestone in your fascinating journey!